My bikes are not new, so I usually don’t do product reviews. My oldest bike is a 1971 Raleigh that I use for going to local stores or restaurants. Others are more recent including a 2001 road and a 2008 cross bicycle. Occasionally I do replace old components for new ones, but I prefer writing about bicycling experiences, infrastructure issues and policy rather than equipment. I also just like to ride a good bike without worrying about whether it has the latest or lightest components. My aversion for doing product reviews recently was softened when I replaced my venerable Brooks Team Professional saddle with a new Brooks Cambium. Released in 2013 this new Brooks Cambium C17 is a newborn in the line of Brooks Saddles. Many of Brooks bicycle saddle designs date from the 19th Century. The B17 was first released in 1888. I purchased my Brooks Professional in 1978. It is still a pleasure to ride (figure 1). My old Brooks Team Profession that I have ridden on and off for over 35 years is still in good condition. But with age, my riding position has changed. I ride in a more upright position due to a cranky back and my posterior has less padding than in the past. The old Brooks Team Pro is molded to my backside, but even after years of riding it is still somewhat hard and a bit slippery. If the saddle is not mounted perfectly, you slide up to the nose or back on the rivets. I ride a cross bicycle on the C&O Canal quite often, and the surface is packed dirt with lots of stones. With the Brooks Team Pro riding over many bumps transmits a series of shocks straight up from the path to my bottom. This is not to say that I have given up on this saddle. It will go on my road bicycle, where it will encounter a smoother and more welcoming surface. Over the years I also had tried many of the plastic and foam saddles, and they were okay, but I never really thought about giving up my Leather Brooks Team Pro for one of them. 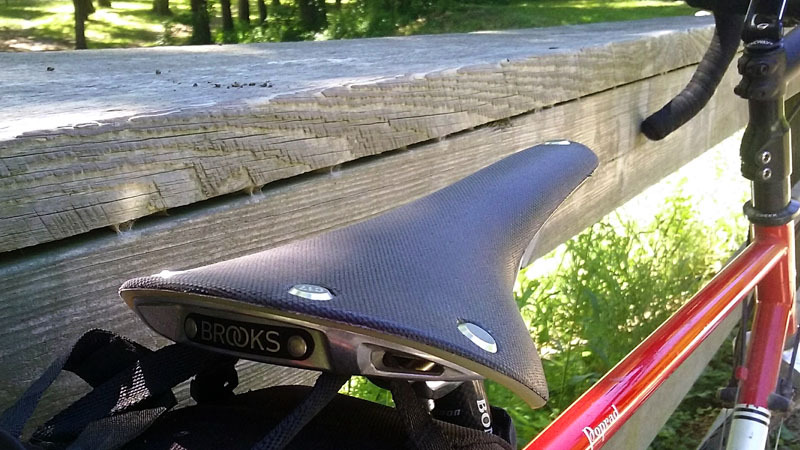 Then recently I was looking at the Brooks line of saddles and I discovered the Brooks Cambium and it piqued my interest. Cambium is actually a term in biology that according to Webster’s Dictionary means “a thin formative layer between the xylem and phloem of most vascular plants that gives rise to new cells and is responsible for secondary growth.” Apparently this is the origin of the rather distinctive name for a saddle that has a vulcanized rubber underside with organic cotton infused on top. 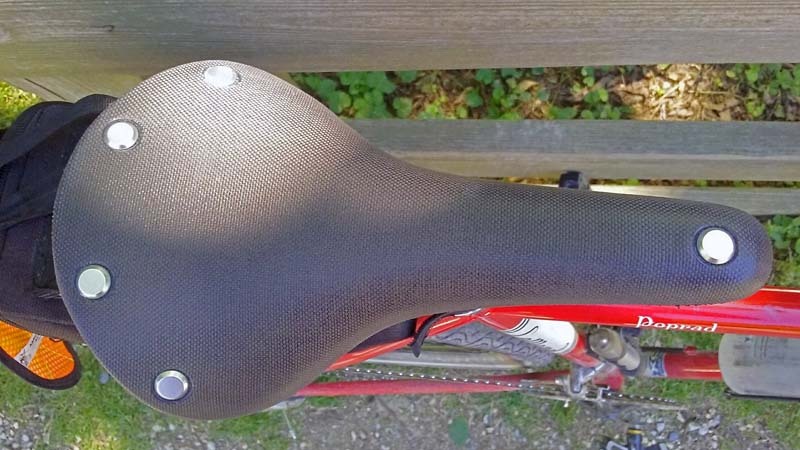 The design of the Brooks Cambium is rather unique. It takes some of the principles from the old leather classics, but then applies a modern twist. The rubber underside of the saddle provides both resilience and stability. 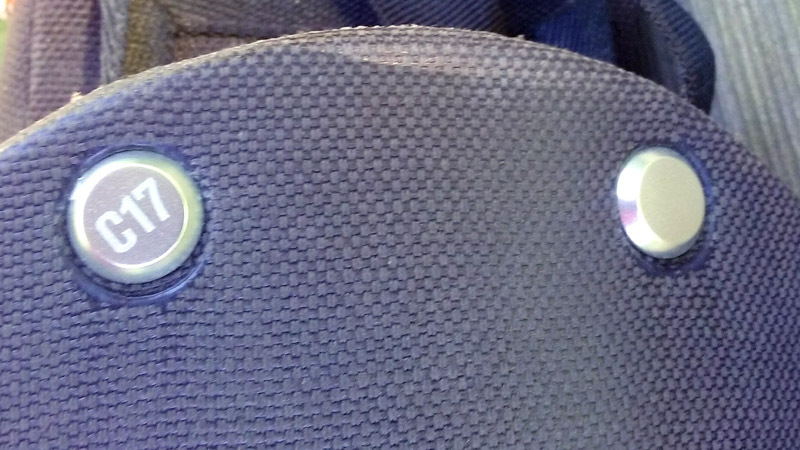 Instead of sitting on top of a hard molded plastic base-as is the case with modern plastic and foam bicycle seats-the rubber is stretched between the nose and rear rivets just like the Brooks leather saddles (figure 2). The rubber therefore provides a hammock like feel. The problem with most plastic and foam saddles is that usually you have to try out many different models before arriving at one that is comfortable for your particular shape. In other words, plastic and foam models don’t adjust to your bottom. Instead, your shape has to adjust to the seat which can be quite uncomfortable unless you luck into the right fit. Trying to alleviate this problem, some manufactures use a gel material on the top of the saddle and have systems to measure sit bone width. This means you do sink in, but the gel is rather fluid and moves around making one feel the saddle is squishy. In addition, most people buying seats don’t measure the distance between their sit bones. They just buy something off the shelf or online. 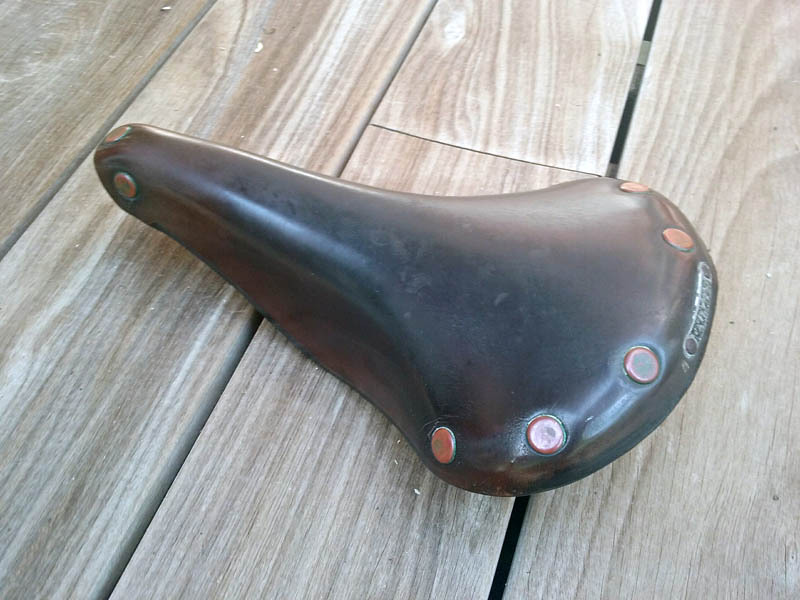 The idea of using rubber with a fused cotton top design was a way to make a unique new bicycle saddle that fits into the tradition of Brooks. The design does sacrifice the classic advantages of Brooks saddles. The main one is that its line of leather saddles shapes to your posterior. The new saddle does not exactly do this, but instead provides a flexible hammock like flexibility to absorb road or trail bumps and irregularities (figure 3). At least this is the theory. Recently I took my new Cambium for a test ride on the C&O Canal which has packed dirt and stone path. Upon first sitting on the saddle, I miss the feeling that my posterior settles into a “custom” molded leather saddle. However, this lasts only a few minutes as the rubber starts to respond, providing cushioning. This is not to say the rubber base in the saddle molds to your backside. Instead it is more like a taut hammock feel. With the stretched rubber the saddle is firm, but flexes with the contours and bumps in the road. Riding along the Canal my new saddle absorbs the vibrations from the packed dirt (gravel) paths. Despite soaking up shocks from the path, the saddle feels quite firm. The claim the saddle is comfortable out of the box is true. Once adjusted properly in a level position, the ride is quite pleasant. My longest ride so far is 21 miles on the C&O Canal. The seat handled the rough surface quite well. I also noticed that the side flexibility helps to reduce chafing on the inside of my legs. This new Cambium definitely has quite a different feel compared to the Brooks leather saddle. In the leather saddle you sink into it so the road vibration spreads across your bottom with just a little give in the saddle itself. With this new Cambium design, I feel more of a flat surface that gives and absorbs shocks well, especially minor ones. The saddle springs back and forth in a variety of ways, all within fractions of a second. The top also feels less slippery than my Brooks leather saddle. With fatigue, on the leather Brooks saddle I move around a bit on the saddle at the end of a long ride. 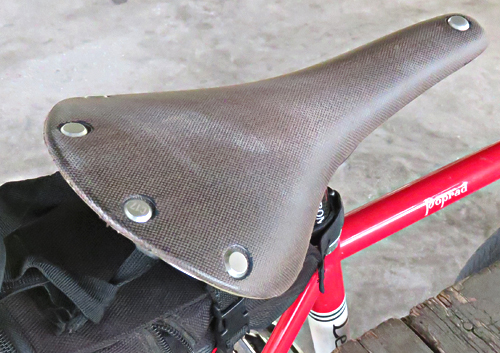 The Cambium has a textured cotton surface (figure 4), so I feel steadier on the seat. It also seems to breathe fairly well. By the end of the ride I do not feel that it’s making my shorts any more soaked with perspiration than my leather saddle and it’s definitely better than the plastic ones that I have used. Finally, I think it looks nice on the bike. One note of caution is in order. The adjustment of the saddle is quite important for its comfort. Brooks recommends that the saddle be adjusted so that it is level with the ground or has a very slight tip backwards at the nose. This is so that the rider naturally positions on the broader back side and not the nose of the saddle. To achieve this saddle position I have a microadjustable seat post which is also recommended by Brooks. I used a level to make sure this adjustment was correct. In my first test ride with the saddle, I was able to sit on it in a comfortable position, neither sliding forwards or backwards. So far I am quite pleased with the new bicycle saddle, but there are a few negatives to consider. I definitely do have that feeling the saddle adjusts to, but is not molded to, my seat. I am of average weight and I wonder whether the saddle will feel hard to a light rider or have too much sag for a heavier bicyclist. The saddle also is not cheap, retailing for $160. I purchased mine for about $115. Purists may point to the weight of the saddle, but for me trading off weight for comfort seems a good compromise. For the non-purists the seat may feel a bit springy or they may want more cushioning. For me the saddle doesn’t seem too soft or too hard. I may not have seen much difference between the Cambium C17 and my Brooks leather saddle if I didn’t do quite a bit of riding on packed dirt and loose stones. After several rides of over 20 miles on the C&O Canal I did notice less saddle soreness than Brooks leather saddle. But to be fair, my old Brooks Team Pro is over 30 years old and my bottom is not as resilient as it used to be. Also, getting older means my more upright riding position puts more pressure on both saddle and seat. As a caveat I have only ridden the Brooks C17 for between 100 and 200 miles. I will put an update in this post when I have put more miles on the saddle. To sum up, I am impressed with the new design. It is flexible and the rubber stretches as you sit on it. It absorbs the jolts from riding on gravel or irregular pavement quite well. The cotton texture keeps me from sliding backwards or forwards. As a result I stay firm in the seat. My preliminary impression is that this is a great compromise between the Brooks leather saddles and the more common plastic and foam models. It must have taken Brooks quite a while to get the saddle “just right,” not too soft and not too stiff. It is a new take on the principles behind the venerable Brooks leather saddle, with a more modern twist. I now have been riding the Brooks Cambrium C17 saddle for over one year and it is still very comfortable. The saddle feels the same today as the first time that I rode it back in 2017. Now that I have a few thousand miles on the saddle, I have some additional observations on the Brooks C17. 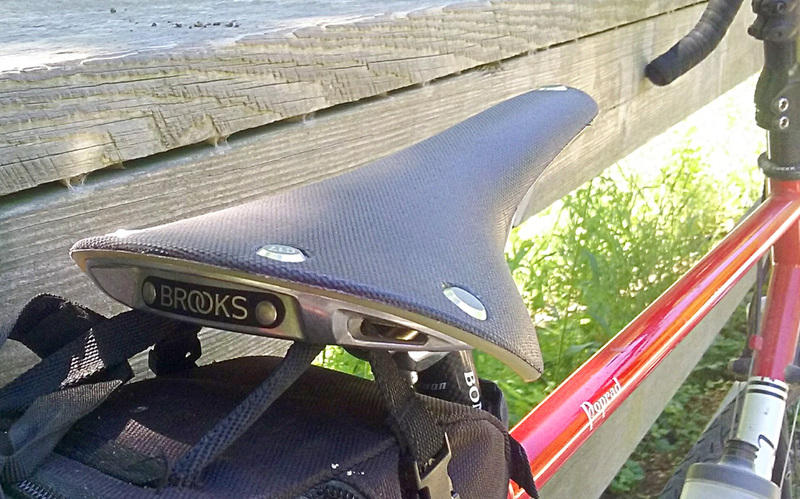 As indicated in a previous section, the Brooks C17 saddle takes a different approach compared to most bicycle seats on the market. The rubber provides a more spring-like feel--more like a hammock--compared to the firm spongy impression of foam-over-plastic saddle. This give in the Brooks C17 definitely helps if you are riding on packed dirt or bumpy roads. My usual rides are on rough urban streets and the C&O Canal, both of which have rough surfaces. The Brooks C17 feels right at home in these conditions. Compared to my over 30 year old Brooks Professional saddle, the Cambium transmits less shock to my bottom. Depending on point of view, this is both a positive and a negative. The lack of breaking has the downside of not adjusting to your backside. This is not a problem if the saddle fits right out of the box, but it also means that it will never get better than that first ride. If it doesn’t feel right, then take it back and exchange it for another seat. The feel of the Cambium saddle will not change with use. The seat cotton surface has not degraded over time and I still don’t slide around on it. There is no fraying of the cotton material on top of the rubber. I have positioned the seat in a level position. I often change positions on the seat depending on whether I am climbing a hill, riding on level or descending. Positioning myself on different parts of the saddle is not an issue with the Brooks C17. I don’t slide around, but it is also easy to change positions. The slate grey cotton surface has begun to fade (figure 5) and his become more of a brown color. This seems a common problem with the seat. Despite this Brooks C17 is still quite attractive and has maintained its shape after a whole year of flexing under my weight. One drawback is that a creaking sound has developed in the nose of the saddle. This problem has been reported by others. At present, it isn’t annoying enough that I have tried to eliminate the sound. The creaking happens only when I start off my ride and then disappears once I settle into a cadence. If it gets worse and I do fix it, I will provide an update. After a year of riding I am keeping this bicycle saddle. It fits me well and I see no reason for changing to another model. I am sure there are other bicycle saddles that fit me out there in the marketplace, but I am thankful that I have not had to try 5-10 models before settling on one that I like. The Brooks C17 is a keeper, for me at least! I've had the same experience with my C17, Doug. The saddle 'feel' hasn't changed since my first ride on it. And it remains a nice looking part of my bike.